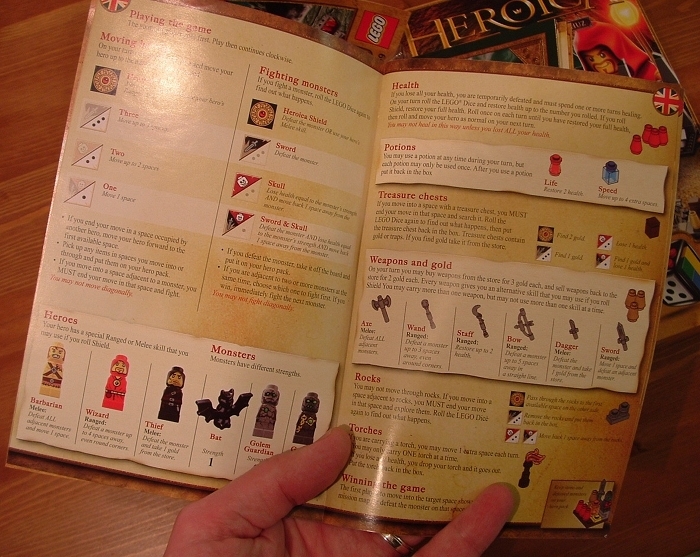 Review: Heroica (Nathuz) – What’s In The Box? Nice and easy. Even the harder parts don’t look very hard, and they hold your hand all the way along. The rules look quit busy, but are only 4 pages long. 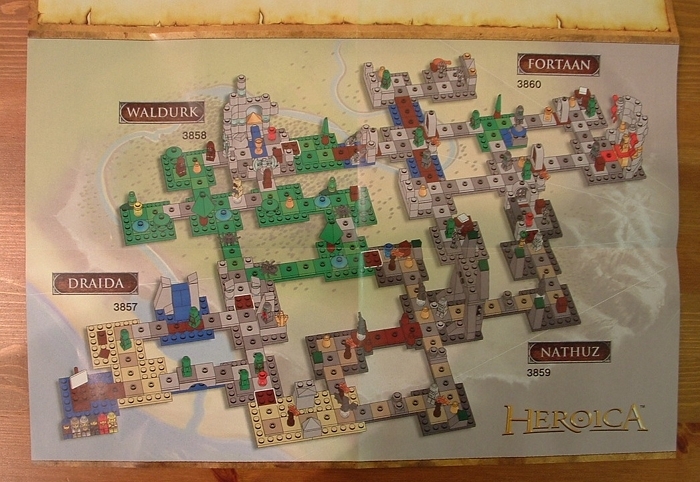 And speaking of adventures, if Nathuz isn’t big enough for you they designed all the Heroica boxes to go together to make up this enormous dungeon shown on the poster in the box. Why do I always read that as Fortran? But I’m rambling. I said I’d tell you what’s in the box. Well, the box contains lots of bits of Lego together with one of their DIY Lego dice. 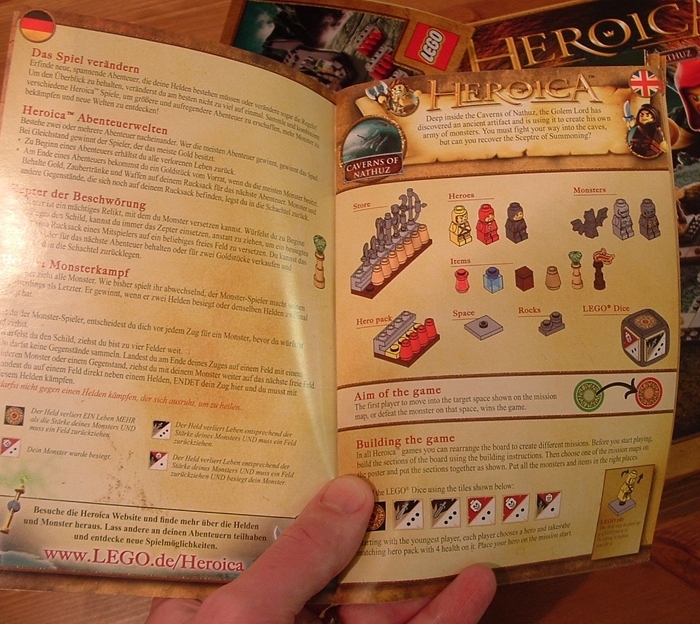 It also has an assembly guide, a poster showing the last steps in assembly plus how to join all the boxed sets together (above) and a little comic strip. Finally there is a rulebook in multiple languages. The box itself is not a traditional rigid card box, but uses a light corrugated card to get a similar rigid effect and feels nice and sturdy. All told the box is a little over half full. However, I expect it will be useful for storing the half assembled game between sessions. Also, the game is cheap. For the money it felt like a fair amount of stuff and a good price to encourage kids to buy it themselves rather than wait for a birthday to get it. 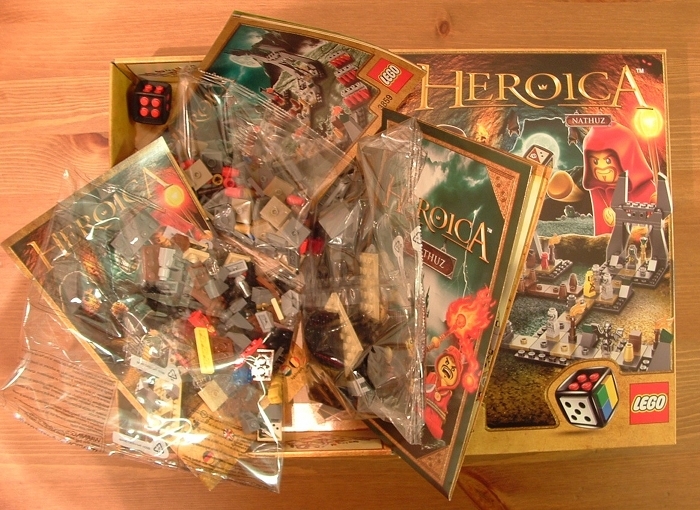 5 Responses to Review: Heroica (Nathuz) – What’s In The Box? Looking forward to how it plays. I got a box on sale but we are keeping it for xmas so I have not played it yet. It also reads Fortran to me, seems like like a blast from the past. We have the Harry Potter game and that is interesting but I think of it as a board game. Legos do work good for this it will be interesting to see if they take it farther. With the kids I get to build up Lego kits on a regular basis over time you develop a method and I now stick slavishly to the instructions. I already got have some extended rules that seem usable and I can translate them for you if you are interested. I read the title of the IA8 book always as Castrop-Rauxel (a city in the Ruhr-Metroplex area) ;).